east side bride: Did watching the Royal Wedding inspire me to make a terrible fashion choice? Did watching the Royal Wedding inspire me to make a terrible fashion choice? I was planning on a birdcage, but this just looks way more fun. But will it be too much? Can I get away with it? I tend be to a typical Pacific Northwesterner, which means I dig boots, fleece, and nothing too fashion crazy... but maybe it's about time to change that whole thing. Do not wear that thing. And nix the birdcage whatever, too. Sooo tired, been done to death, and never looks good in photographs. In a word ... dated. Personally, I love that fascinator--though I'm not sure it goes with your long lace dress. It would be better with a sharp curvy little cream-colored suit, I think. And I agree that birdcages are done to death. But really? I think you should go with your gut and just choose whatever you love. This is a chance to wear something exciting you wouldn't usually wear. Have fun! i think it's kinda groovy, but not for the bride. I agree with anon. 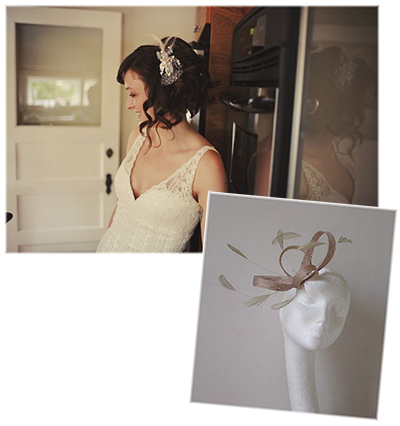 Fascinators are the hat's little sister and for guests only. If you're going to be influenced by the royal wedding, choose a lovely veil. Hmmm.... yes kind of agree, but also, if you want a fun fascinator, then go for one, but maybe a better one. That strange fabric they use in those fascinators remind me of what frumpy mums buy in M&S. Hey, what about an art deco hair comb? Or earrings? That's an awfully sad little fascinator. that is a very unfascinating fascinator. i am SO feeling a fascinator for that dress... but i am not feeling that fascinator. it looks like it will flatten out in 2 seconds and be a droopy mess in your hair. my suggestion? find your most fashion forward friend and ask them to go fascinator browsing with you. find something that has more substance & a little bling. I'm with Nicole. Rock a barrette. Just do it. 1. Axe the Etsy seller if you can try it on with your dress and return for a full refund if it ain't working. 2. Go with a veil for the ceremony and rock a more understated but equally whimsical little feather ensemble to clip into your hair for the reception. Heck, maybe that Etsy seller will even custom-make something to go with your dress. Honestly, the headgear is so irrelevant; just EAT CAKE AND DANCE WITH HUBSTERS and savor every minute you have with him while he sports his awesome traditional man-lace. fascinators are going to be super trendy and then super dated. they're be like the wedding hats of the 70s and puffy sleeved dresses of the 80s. go with something more classic. you'll thank yourself later. HA! thanks for the advice ESB and all. I do appreciate it. I ordered the fascinator, wanting to see it in person, and I did check out the return policy ahead of time (can return). That all said, I'm still debating, and I just might go for it, if i love it on, even if it looks dumb or dated in the future. or i might go with a little pretty sparkly thing in my hair... even though barrettes bring up memories of elementary school. i could try to bring them into the present. @Anonymous - 5:17AM : Heck no to a long veil. Sorry, but NO WAY. I nixed that about 0.03 seconds upon being engaged. thanks for the nice comments about the dress. i am more than kind of in love with it. Since when did dated become a dirty word? Let your marriage be timeless. Your wedding is a reflection of who you are in this moment. Own it. UH-greed, Maddie. I love it when I see something fabulous from the 50's or 70's or whatever and it's totally reflective of that time. Must be cause so many of us are children of the 80s and scarred from all the scrunchies that we're always trying to rise above the current time. I personally love that fascinator but then again having something a little off kilter is very my style. With a long lacey dress it could work as a little contrast / update but it would also work well with a barret etc. I think you need to go with what you feel best in. If you feel chic in the fascinator, go for it. If you feel better in something else do that. Its all about you!! Phew...thanks Amy! I plan on wearing a birdcage and started getting pissy after reading these comments!! GOD FORBID I come off as trite!